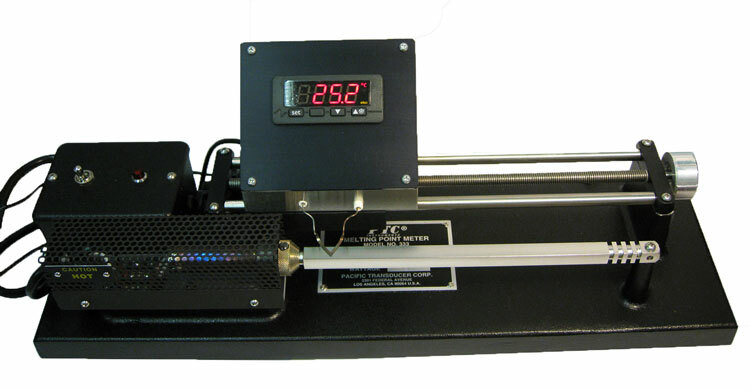 PTC®'s Digital Melting Point Meter can be used for testing melting points of plastics, waxes, resins, inks, gum, fats, tars, and low melting alloys. A melting point is a temperature at which a substance changes its state from solid to liquid. Under standard atmospheric pressure different pure crystalline solids will each melt at different specific temperatures; thus the melting point is characteristic of a substance and can be used to identify it. The instrument is portable and can be used on any workbench or desk. The unit works on standard 110V AC 50-60 Hz. The warning light next to the on/off switch cautions the user that the heating element is on. The stainless steel platen heats to a 400°F temperature gradient across its length. Portable unit -- weighs only 10 lb. Length 19-3/4 in. (50 cm). Width 6 in. (15 cm). Height 7-3/4 in. (20 cm). Power source required 110V AC, 50-60 Hz or 220V AC, 50-60Hz. for digital display 12-Volt transformer. Weight 10 lb. 2 oz. (4.1 kg). Shipping weight 14 lb. (6.4 kg).